Prices DO NOT include shipping. Shipping is anywhere from $3-$12, depending on the number of figures you want. Minimum of $10 though, please. Prices are intended for people to buy a few at a time. PM me with any questions. Photos available upon request. Thanks. Last edited by Optimus Vader; 10-20-2014 at 10:26 AM..
Last edited by Optimus Vader; 04-27-2011 at 07:07 AM.. I can hear crickets. I think it's time for a "going out of business" (Times Square Style) sale. If anyone wants to make me an offer for any of this crap, please do. This is getting boring. Hey it's me again do u want anything to trade for the Alan Scott u have? Green Lantern Movie Master Hal Jordan - $10 SHIPPED!!! Someone take him please. Added Marvel Universe Cable, Apocalypse, & 1st Appearance Wolverine. I'm only trading Cable for something I really need. Added some MOTUC & GL Stuff. can you point me to a pic? How is the quality? I sold him the day you posted this. The quality is very good. Very thick/strong plastic... very solid figure... you could beat someone good with this figure and it would probably not break. I think it's missing a little bit of coloring, but otherwise I'd recommend it. Added Crossbones & Red Skull. Hmm you're selling the ENTIRE GL pack for $25? Correct. That price does not include shipping though. PM me if you want it. A regular (in color) Dr. Strange. 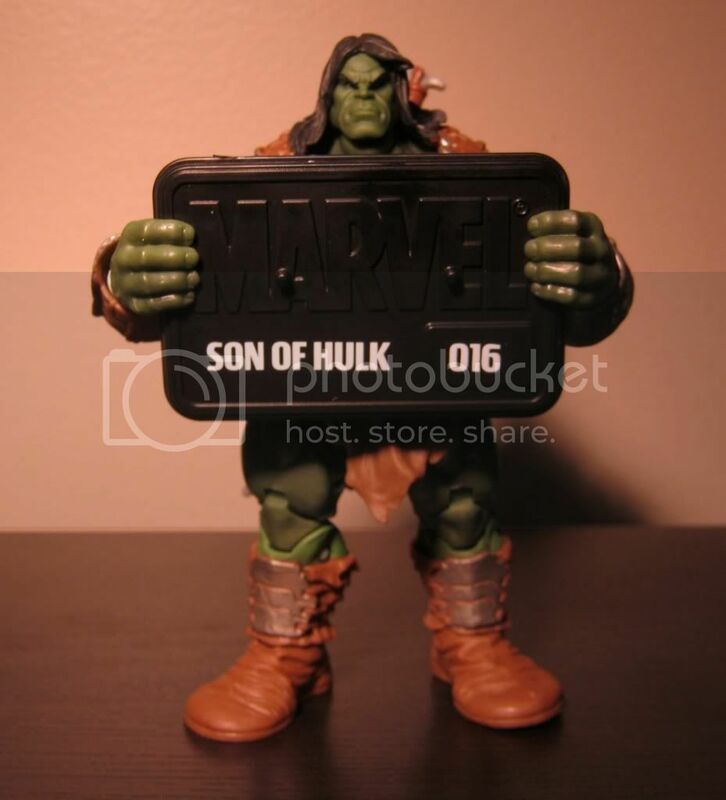 It says "Son of Hulk," genius. U sell that green lantern 5 pack? Yup. That's why I put SOLD!! next to it. Your thread is full of win. For those that don't know, great guy to deal with.